Every content marketer faces the challenge at some point of trying to figure out how to publish enough content to make a difference to your audience and your business. But you only have a tiny budget. And you want to maintain a high level of quality. So how do you get the volume you need at a price you can afford? Part of the answer comes down to building a volunteer army of contributors who will give you high-quality content, on the topics important to your business, for absolutely no money. That’s right. You can get access to tons of articles, infographics and videos. And all you have to do is ask. Back in 2010, Brian Rice and Dan Criel, two guys who worked for me at the time, helped me start B2B Marketing Insider as a personal favor. I started publishing my own rants and raves on content marketing, social media and marketing strategy right here. Separately, Brian started a “sister” site called B2C Marketing Insider (now Business2Community.com). This was based off some simple SEO search analysis. And while I started writing my own posts twice a week, Brian eventually started reaching out to friends and family members who were already writing articles on social media and search engine optimization and marketing strategy. They asked them if they wanted to contribute original guest posts. The authors were all thrilled as the traffic and exposure they received were greater than what they could do on their own. This is the power of guest posting that is now a common best practice for bloggers. After months of publishing content from a small but growing group of authors, they submitted B2C Marketing Insider to Google for inclusion in their “News” service. Google somehow accepted the site as a source of news and the traffic began to take off. That site now has thousands of contributors who submit both original and syndicated content that allows them to publish hundreds of articles every day. The traffic on the site was once well over a couple million pageviews a month! Business 2 Community built an entire media company using an army of volunteer contributors. While still at SAP, I took a similar approach to the company’s Business Innovation site. I was given very little money to build the site and almost nothing to create original content. I actually wrote the first 24 articles myself summarizing white papers produced by our campaign team. 6 articles for each of the 4 categories we launched with. But we wanted to publish 1 article every day for each of the 4 topics. So without any budget, how was I going to find authors and articles who would write for me for free? The answer: I built an army of volunteer authors based on serving their own self-interest. Step 1: I identified all the internal employees who were already blogging on the topics I thought our audience was interested in. They had to already be writing high-quality content. 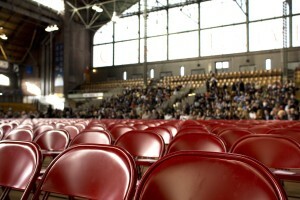 Ideally, I also looked for those who had a built-in social audience. I found 12 great bloggers. Step 2: I approached them and pitched the dream I was chasing of building a world-class content marketing hub. I tapped into their emotions and their own dreams of reaching new and bigger audiences. I asked them simply for permission to allow me to syndicate their existing blogs through an RSS feed. All 12 agreed and gave me permission to syndicate their content. Step 3: Using the WordPress FeedWordpress Plug-in, I added their existing RSS feeds and all their posts started coming in as new, full-length article drafts I could post on our site. we generally waited a few days to post their articles so they could get all the benefit of their original posting. We shared every story on our social channels. We thanked our authors on twitter. We believed strongly in creating a sense of community with both our readers and our authors that went beyond just the traffic and exposure we were giving them. Step 5: Using the amazing results from the traffic, engagement and conversion we started seeing, I requested and received budget for original content creation and later, licensed content from NewsCred and a budget for paid distribution. We also started reaching out to external bloggers and thought leaders. At some point, we hit a tipping point and bloggers started coming to us and asking to become contributors for both original and syndicated content. We had reached what I love to call “escape velocity” where growth becomes a virtuous cycle of publishing, sharing and engaging with more readers and contributors. Step 6: Extending the community. My amazing former team sends out a weekly author newsletter that lists the “top 10” posts of the week, recognizes an “author of the week” and provides writing tips and examples of great content from others. I am sharing these stories and tips and steps to building your own volunteer army of content contributors so that you can see the same kind of success that these sites, and now many more are seeing. I call this approach “Author Curation.” This combines some forms of social listening, influencer marketing, strategic content curation and content strategy. All you need to do is align the interests of your audience, with the topics you want to focus on, and the content written by influential authors, and you can make this work. And then follow the steps I outlined above. Let me know what you think in the comments below. Michael – as one of the authors whose marketing blog is syndicated in B2C, it’s interesting to hear about the founding and evolution of the site. Thanks a lot for sharing the history and details! Thanks so much Tom! I always try to tell brands that this content marketing gig is not as hard as everyone thinks. It’s not exactly easy either, but there are ways to make it work on a limited budget. This is great advice and I love that you’ve pointed out the simplicity of how you actually do this. Companies often nix this approach to building audiences because they think that it’s too much work. When, in fact, it’s sticking with the traditional ways of building online audiences that are overwhelming. Thanks Carla, it’s so important to think about the right mix of content to drive both efficiency with your budget spend and effectiveness. Original content is great for SEO but can be expensive. Curated content is great for Social but doesn’t help SEO as much even if it is free or lower cost. Syndicated content helps to drive traffic with great content for little or no cost. It also helps to build community with your influencers and target audiences. So everybody wins! That is impressive, Michael. It is amazing what a committed team can do. I have considered guest posts and collaborations on my blog, so this was a useful how to. Thanks again.